When I read about the publication of the book on various forums and blogs, my interest was definitely piqued: the author, Stefan Kottwitz, is a frequent and helpful contributor/moderator on TEX.SX. 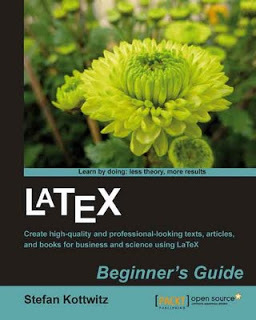 On the other hand I wondered if anyone would actually want to buy an introductory book to LaTeX, considering the many free tutorials and eBooks available on the Web (although there are many out-of-date ones, so beware! See some recommended ones at the end of this post). Your mileage may vary, but I do feel that such a hand-holding approach (that’s what my training course had been described as) — at least in the early days of learning LaTeX — is very reassuring. Especially so since LaTeX can be rather intimidating for people who have only used WYSIWYG word processors before. Pop quizzes are interspersed throughout the content (answers in the appendix). While the early chapter headings are kind of expected of any beginner’s guides, they do still contain valuable nuggets. For example, the microtype package is introduced in Chapter 2, as is how to define your own macros with \newcommand. Imagine a beginner’s joy at the even more beautiful typesetting afforded by microtype. And the new-found freedom of defining one’s own commands for consistent typesetting of certain materials. Personally I think such tips, introduced at an early stage, would boost beginner’s confidence in using LaTeX. While some might consider the installation instructions of TeXLive and TeXworks in Chapter 1 as frivolous, I certainly welcome the instructions on how to install extra packages in Chapter 11. I also like the mention of getnonfreefonts in the chapter on fonts. Another favorite chapter of mine is that on Troubleshooting, as this is definitely one of the most important skills if one is to use (and learn!) LaTeX. And everyone who’s going to write a thesis or a business report will definitely want to read Chapter 10 on large documents. Overall, the book does cover everything a beginner should learn about LaTeX, IMHO anyway. My only nitpicks are that the LaTeX logo isn’t typeset ‘properly’ in the text; and that the LaTeXed output images seem a tad blurry in the PDF eBook version. But these are just petty nitpicks, really. The book is available as a printed copy (£25.19), eBook copy (£16.14), or multi-format (£28.04). Shipping is free if you’re in UK, US, Europe, Brunei, Hong Kong, Indonesia, Japan, Malaysia, Philippines, Korea, Singapore, Thailand, China, Macau and Taiwan — sweet! Getting to Grips with LaTeX. A personal favorite short beginner’s tutorial. The LaTeX WikiBook. A nice quick online reference. LaTeX and Friends. This is truly a very comprehensive up-to-date eBook for reference purposes (but it does not have complete examples as Kottwitz’s book does). I understand that the author is still updating it from time to time. Perhaps it’s all the publicity work by the good people behind MOSC 2011 (thank you! ), during the last week or two I’ve definitely been getting more LaTeX enquiries (thanks to all of you too!). So much so that I was very kindly offered by Packt to review a recent book on LaTeX by Stefan Kottwitz! I’ve read about the publication of the book on other blogs and forums and my interest was already piqued; not least because Stefan is a very frequent and helpful contributor on TeX.SE. Well, I have a book to read and a review to write. Stay tuned!